After holding on to this trade for almost a week, I finally got stopped out yesterday. What a sad, sad day it is for little noobie Huck! But don’t worry, I’m okay now. I’m an expert when it comes to moving on. Ha! I really thought I was going to get a huge win on this one though. Heck, USD/JPY initially went almost 100 pips in the direction I wanted! Since I was trading daily chart, I decided that 100 pips wasn’t enough and that there was no reason to exit since it had looked like I had caught a bottom. Then, in a surprising turn of events, the Osama Bin Laden was reported to have been captured and killed by the U.S. It triggered a wide-spread case of risk aversion as investors believed that Osama’s death would lead to terrorist groups launching attacks to avenge him. As of now, I don’t have any trade. Boo! I need one that I can open and close before the week ends and is based on the 1-hour chart. Got any ideas I can work with? You can write your suggestions in the comment box below or you can hit me up on Twitter or Facebook. I know buying the dollar is risky because I’m going against the trend. Gosh! I feel Blair Waldorf, breaking the status quo by falling in love with Dan Humphrey. But like love, what is trading without taking the risk? Besides, it’s not like I took this trade on a whim. No sir! On the fundamental side of things, I’ve read that market junkies are looking forward to the FOMC statement on Wednesday. It’s gonna be Fed Reserve Chairman Ben Bernanke‘s first post policy meeting press conference and he’s expected to talk about the end of QE2. Such a move will probably be bullish for USD/JPY as it would clean up the excess liquidity weighing down the dollar. Of course, I also acknowledge the fact that Big Ben hasn’t always had a way with words to woo in bulls. However, I’m thinking that perhaps BOJ Governor Masaaki Shirakawa‘s dovish remarks will be enough to get traders selling yens. The BOJ head honcho said yesterday that the central bank is ready to increase its stimulus program in order to support the economy as growth is expected to decline in the first two quarters. I’m also seeing some technical signs that the pair may pop up! First, yesterday’s candle was an inverted hammer. 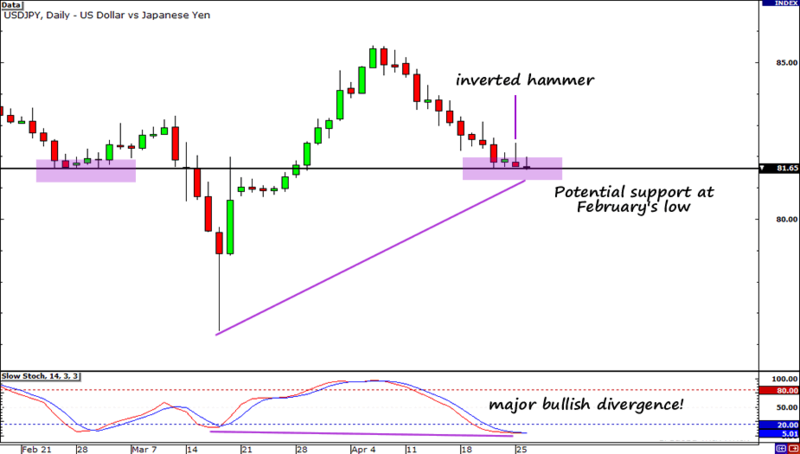 An inverted hammer forms after a looong downtrend, and suggests that the possibility of a reversal. Second, the inverted hammer appeared right at February’s low. 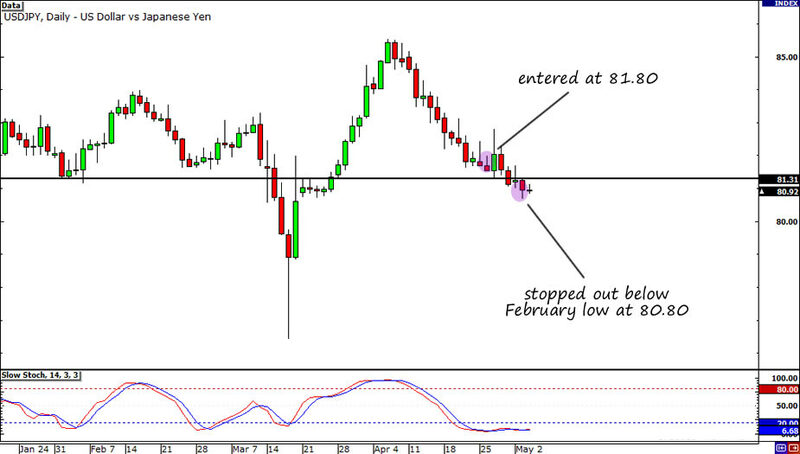 This could mean that USD/JPY has found support and is ready to at least retrace some of its losses. So, based on my fundamental and technical view, I have decided to buy at market (81.80). I’m ultimately aiming for 85.00 but this may change depending on how price moves in the next couple of days. As for my stop, I placed it 100 pips away at 80.80, roughly equal to the pair’s daily average true range. Bought at market (81.80), ultimately aiming for 85.00, stop loss at 80.80. So what do you think of my trade? You can leave your comments below or you can hit me up on Twitter or Facebook.